With its slick looks, automatics tracking, a healthy selection of fitness features, and almost month-long battery life, its hard to find much not to like about Nokia Steel HR. The smartwatch also has notification support so you can keep moving and still stay connected. This is a device that succeeds in keeping things simple. It is clearly not the most powerful fitness tracker out there, so the fitness fanatics who are after lots of statistics may want to pass, but it strikes a balance of features, aesthetics and comfort that will appeal to many. 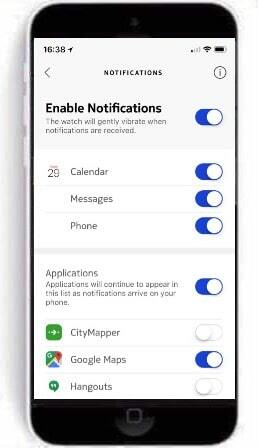 In addition to fitness tracking smarts, the watch also provides smart notifications for Calendar, Messages, Calls and a selection of third-party apps. When a message comes through, a gentle vibration will alert you along with a snippet of the text on the watch screen. Existing users can enable the functionality in the settings section of the accompanying smartphone app. Its in the Devices/Steel Hr/Notifications section. There you’ll also get the chance to personalize the notifications. New users can tweak the settings when they set up the device. After calibrating the hands of the device they’ll get instructions on how to use the watch, as well as the option to switch notifications on or off. The company says the list of third party applications will increase over time. You’ll still need your phone close by to see notifictations, but now it can stay safely tucked away in your pocket and bag.